Neuroscientist Terence Deacon argues that the emergence of symbolic capacities unique to language were a key factor in the evolution of the human brain, and are a key to distinguishing human from animal forms of communication, ways of learning and brain structures. [In] indexical association, [t]he word (iconically associated with past occurrences of similar utterances) and the object (iconically associated with past occurrences of similar utterances) and the object (iconically associated with similar objects from past experiences) and their past correlations enable the word to bring the object to mind. … Animals can be trained to produce the same sign when presented with different kinds of foods, or trees, or familiar animals, or any other class of objects that share physical attributes … . [For instance], the vervet monkeys’ eagle alarm calls might become generalized to other aerial preditors if they were introduced into the environment. [There is] one unprecedented cognitive computational demand associated with language that is ubiquitously associated with all symbolic activities. An unusual sort of contortion of [other animals’ rote, indexical] learning processes is required simply to overcome the mnemonic and attentional threshold that tends to prevent sets of rote indexical associations from becoming recoded into symbolic systems of association. … [T]he particular neural computations required to surmount this mnemonic-attentional threshold are in the prefrontal cortex. 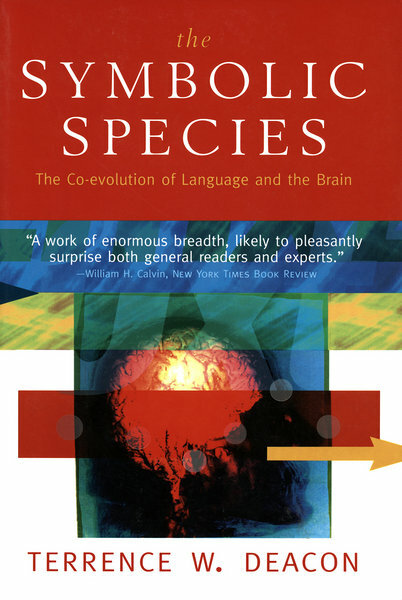 … To some extent, selection for this cognitive function is implicit in the fact that the prefrontal cortex is present in all mammal brains, and is particularly well developed in primates. … [S]ymbolic reference itself must have been the prime mover for the prefrontalizatin of the brain in hominid evolution. Language has given rise to a brain which is strongly biased to employ the one mode of associative learning that is most critical to it.